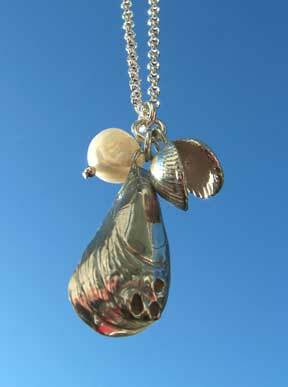 Cockle shell jewellery.On the Burry Inlet on the edge of the Gower Peninsula, South Wales these tasty shellfish have been harvested since the roman times. The women of Penclawdd, the small village on the estuary, used to pick the shells to earn extra cash while their husbands were working down the coalmines. 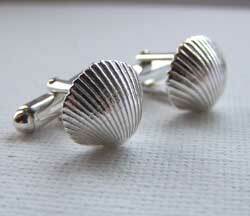 This eyecatching bracelet is made from solid sterling silver. 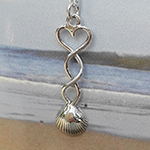 This unusual design has a solid silver cockle shell which forms the clasp of the cuff where a silver 8mm ball snaps into place to sit inside the shell. 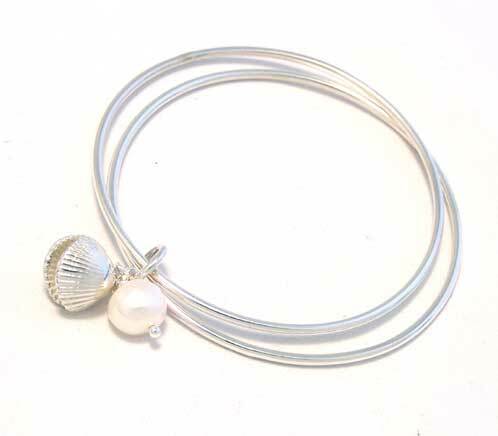 From these two solid silver 2mm bangles hangs a silver cockle charm with a beautiful real white pearl inside. 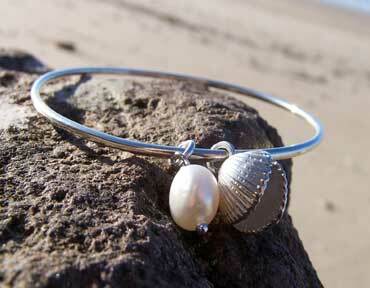 This Solid silver bangle has a real pearl and moving solid silver cockle charm. 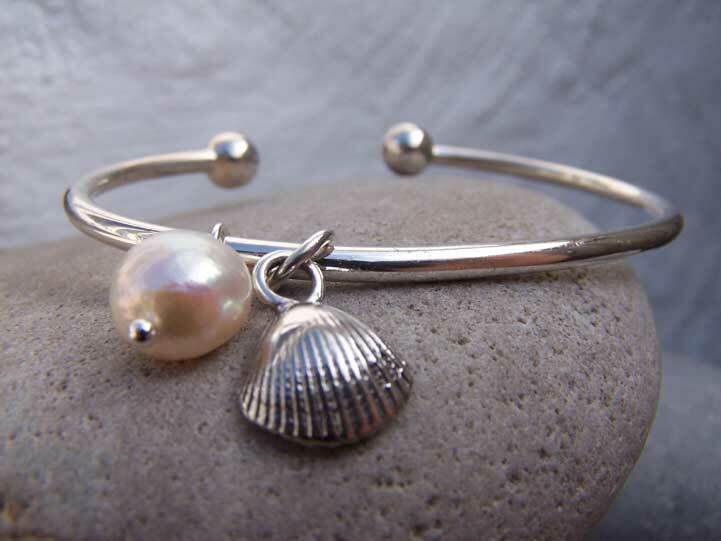 This Solid silver 3mm CUFF bangle has a real pearl and moving solid silver cockle charm. The industry of cockle picking is now under threat due to the dying out of hundreds of these shellfish along the massive cockle beds. The cockles are usually buried under the mud of the estuary, now all that is evident of their presence are vacant shells. As a water sports enthusiast and keen surfer, most of my spare time is spent surfing on the other side of the Burry Inlet on the Gower beaches. An area named for it’s outstanding natural beauty in 1956. 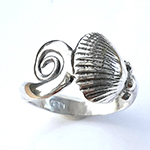 As a silversmith my designs are based on the beauty of the coastlines of Britain and I draw much of my inspiration from marine life, having always had a fascination for the rocks and shells created by the movement of the ocean. 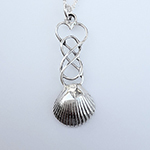 I want my work to reflect the love and respect that I have for the sea and I feel it is important to highlight the struggle for survival of these shellfish. 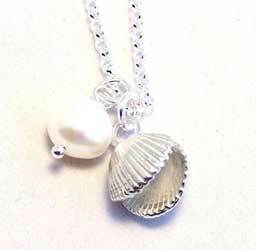 I see my new designs based on this pretty shell as a celebration of its beauty against our harsh pollution of its environment. Copyright © Pa-pa Designs Ltd 2003-2018 Designs registered with the UK Intellectual Property Office, Newport.